Even today that trains have stopped being one of the main means of communication in Uruguay, they still have an affective charge on the sensitive spectator. 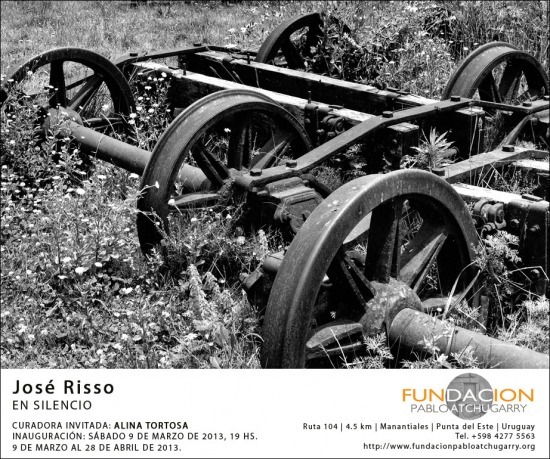 José Risso, because of his search for the data and elements that shape the visual history of Uruguayan Country side, has retaken a photographic study about the old railways stations and their environment. The idea first came of seeing the Uruguayan map – the author tells us – seeing that number of towns in which the train has been dismantled as a mean of transport, I remembered the old stations that I photographed in the past - Sometimes memories of what they were – and I realized that I should record many others. Ultimately, taking photos was the perfect excuse for me to travel and know towns and cities that I had not known yet. He visited many times the stations closest to his home to capture the light changes through the day hours. In other cases, I have travelled over four hundred kilometers only to find a few walls without their roofs and railways covered by grass and vegetation – he adds-. During his tours, his eyes discovered the aesthetic sense of the water tanks that used to supply the water to the machines, the railways, the wheels and the abandoned train compartments. This elements that were fundamental in the operation of the trains, became abstract objects of his lens without their function. Black and white lines and volumes and also in a wide range of grays, form a contemporary vision of the train industrial discard. And once again, as in the previous series, José Risso gives us back the history through images. October 9 Pan de Azúcar.